In a baking dish lay the chicken breast skin side up. Make sure the pan is large enough that the chicken breasts are close together but not touching. Bake in a 375 degree heated oven for approximately 20 to 25 minutes or until a bit stringy but firm to the touch. Let set for 5 minutes before you serve. Garnish with fanned out peach halves and parsley. *Note: the chicken can be substituted with most flat or round bodied fish. Removes side muscle from scallops, pat dry and place in a zip lock bag. Remove from the skillet and let rest for a few minutes. 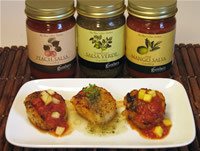 Place 3 scallops on serving dish and top each with 1 tablespoon of the 3 different salsas (See picture). Slice hoagie roll or baguette in half lengthwise and lightly toast under the broiler. Roll the 3 slices of turkey and place on top of toasted roll then top that with 2 slices of cheese. 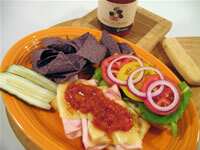 Serve with blue corn chips, pickles and a side of Gunther's Peach Salsa as a dip for the chips and sandwich. Drain Gunther's Peach Salsa through a fine strainer. Keep both the juice and the chunky salsa. Mix the peach juice with the honey and put aside. Turn your grill on high and close the lid until it's about 450 degrees. Then brush your grill bars with a wire brush to clean. Then take and old clean cloth and moisten it with about a tablespoon of vegetable oil. Using tongs to hold the cloth, rub the bars with the cloth. 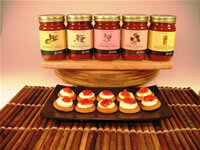 This will help keep the product you are cooking from sticking. Then close the grill and let it come back up to temperature. 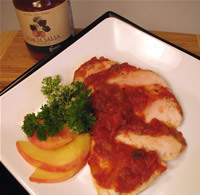 Grill pork chops for 6 to 10 minutes on each side brushing with the peach juice and honey mixture every few minutes. 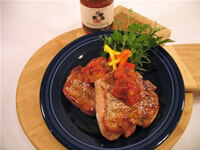 Once the pork chops are cooked (internal temperature of 150 to 155 degrees) remove and let sit for 4 to 6 minutes. Glaze one more time with peach juice and honey mixture and plate. 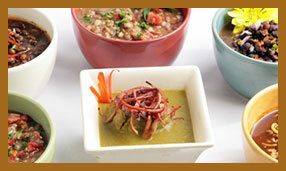 Place a dollop of the drained chunky salsa on top, garnish the plate (see picture) and serve with your favorite sides. Place trimmed tenderloin in a zip lock bag and add jerk seasoning, shake bag well so the meat is evenly coated with the seasoning. Place pork on a cooking rack and place that on top of a sheet tray and put in the 400 degree oven. Cook for 5 1/2 to 6 minutes per pound or until internal temperature reaches 140 to 145 degrees.